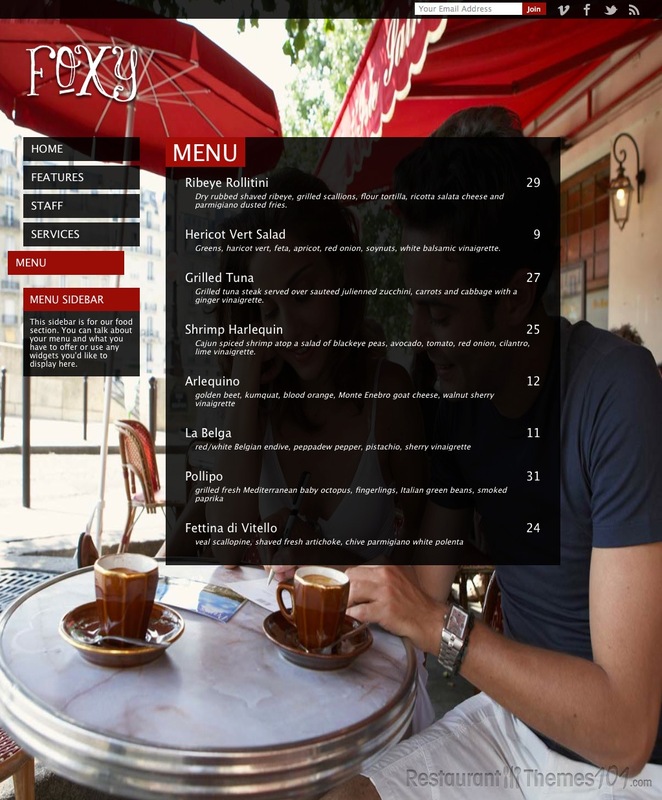 Foxy is a unique WordPress restaurant theme developed by Organized Themes that is sure to please your visitors. It is perfect for restaurants and cafes, but it could easily be modified to work for a number of other businesses. 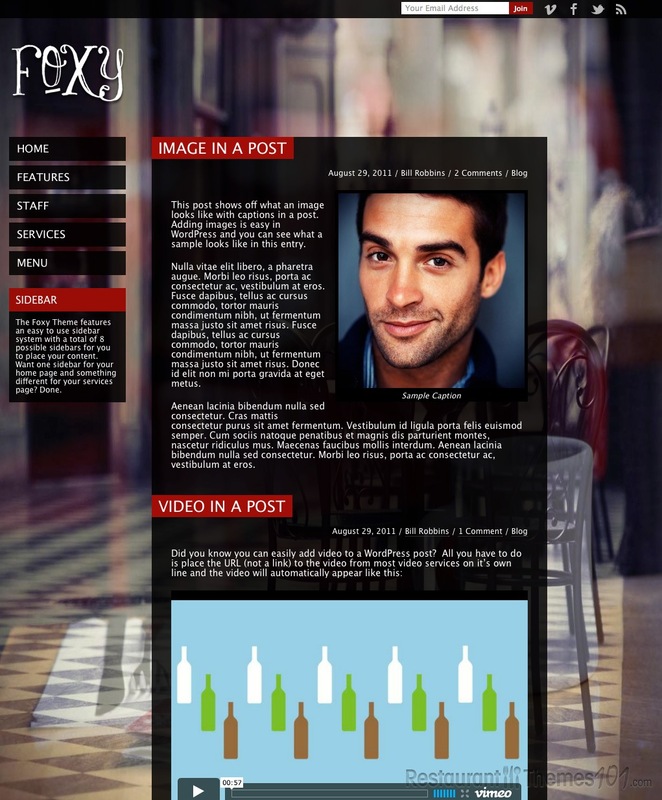 The first thing you will notice when you see the demo or any site running this WordPress cafe theme is that the entire background is a sliding image gallery. This unique feature gives any site running this theme a distinctly original vibe, and is very pleasing to the eyes of your viewers. Using the theme’s control panel, you can change the settings to make the background a static image, a sliding image gallery, or a featured post image. The theme also includes a style editor to add your own color theme. Foxy also has animated menus, which really give the words an eye-popping appeal. MailChimp support comes standard, and it’s easy to add links to all your favorite social networking sites on your website. The theme also comes with Jigoshop and Woocommerce support, which allows you to sell merchandise on your website. And since this theme is built to fit the needs of a number of different businesses, there is the option to add a staff page, a food menu, and even a services section. 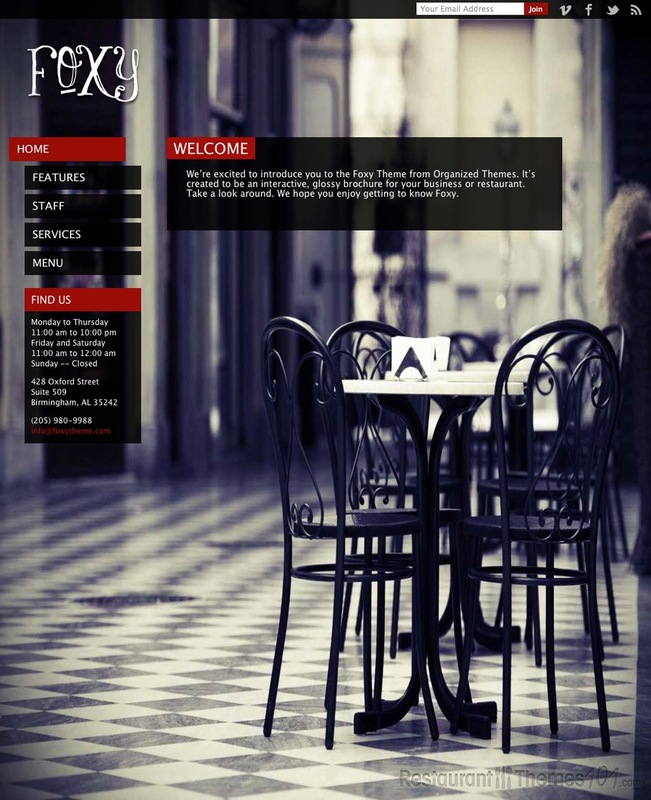 Foxy is also fully responsive, unlike many competing WordPress restaurant themes. What this means is that any site running Foxy will load perfectly and work properly on both computers and mobile devices, such as smart phones and tablets. And lastly, Foxy is cross-browser compatible, meaning it has been developed and tested to work on any common web browser, including Safari, Firefox, Internet Explorer, Opera, and Chrome.